Issued on April 5th. 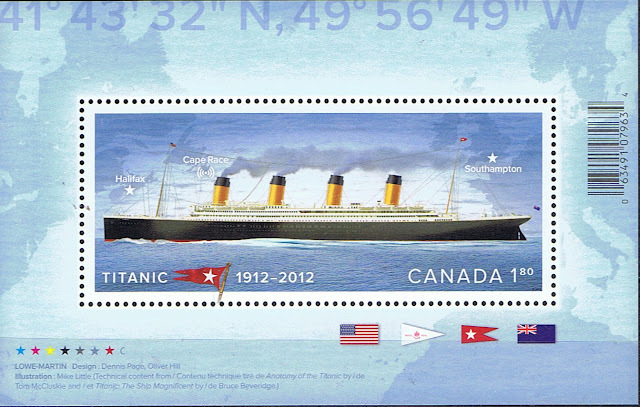 2012, the 100th anniversary of the sinking of the Titanic are among some of the best stamp designs Canada Post has used in years. The sheet of 16 features 4 designs, 2 of the bow and 2 of the stern. They demonstrate the sheer size of the Titanic. These stamps are traditional lick and stick and are denominated P and will always (until further notice) be used to cover the domestic first class letter rate. A souvenir sheet was also issued. 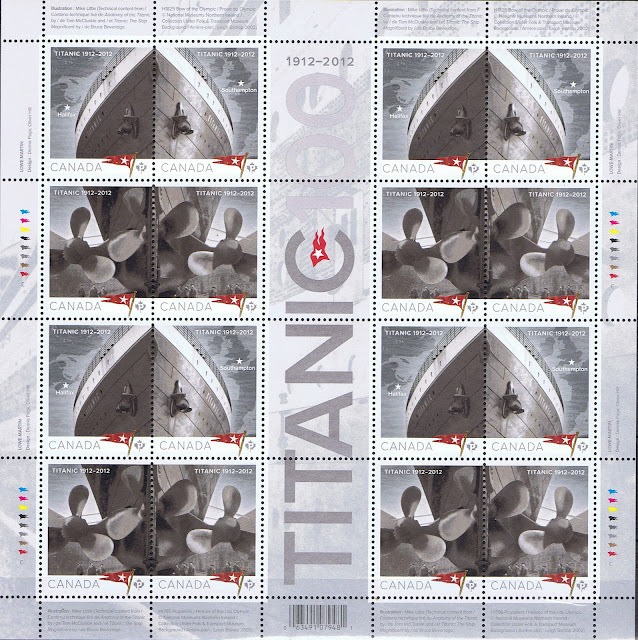 The souvenir sheet features a side view of the Titanic along with the position where she sits across the top of the sheet. Along with sheet of 16 and Souvenir sheet Canada Post Issued stamps in self adhesive booklets as well. 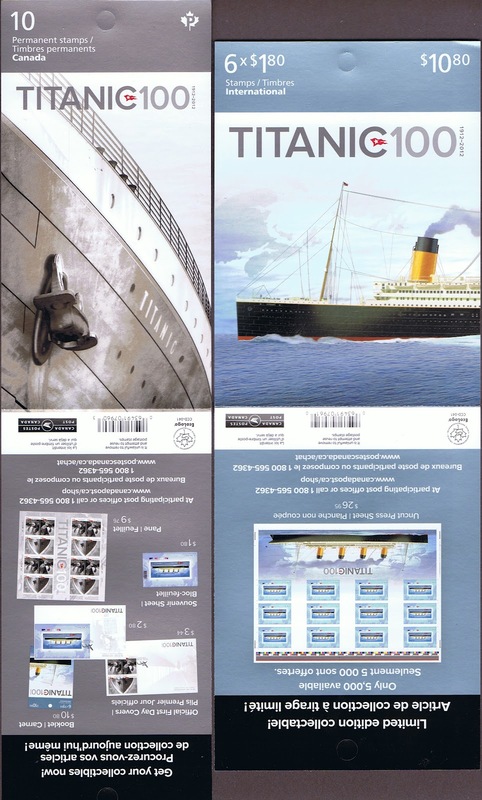 The Domestic Rate booklets only feature the bow designs along with a picture of a deck chair recovered from the wreckage, at the top of the booklet. The International rate booklet stamps features the exact same design as the souvenir sheet. Perforated 13 and die cut 13. Illustrated by: Mike Little based on Anatomy of the Titanic by Tom McCluskie and Titanic: The Ship Magnificent by Bruce Beveridge. Bow and propellors of the Olympic from the National Museums of Northern Ireland. Printed by lithography on Tullis Russell paper. The Permanent stamps have general tagging on 3 sides. The international rate stamp has general tagging on 4 sides. I find this miniature sheet's design a little confusing. My brain asks "what am I looking at - the bow or the stern?" Great observation Theo (I didn't think of it that way), They should have arranged the designs differently on the sheet.